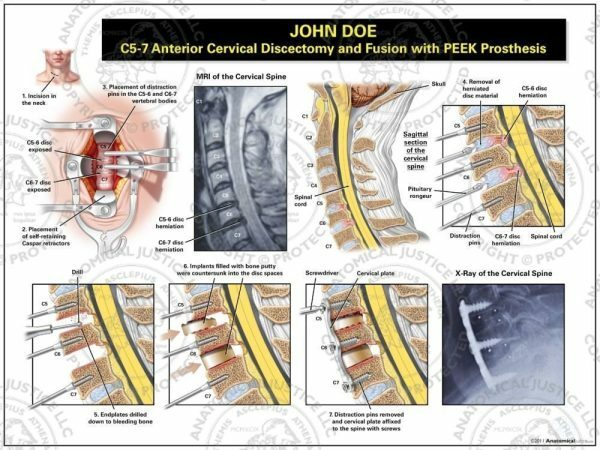 This exhibit depicts a C5-7 anterior cervical discectomy and fusion procedure to decompress the spinal canal. To begin, an incision is made over the anterior neck. Retractors are placed, exposing the C5-7 intervertebral discs. Sagittally, disc herniations are seen impinging upon the thecal sac at C5-7. 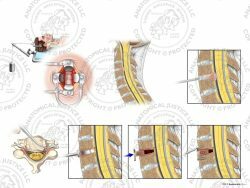 Distraction pins are placed, C5-7 discectomies are performed, and the vertebral endplates are drilled down to bleeding bone. Next, two PEEK cervical implants filled with bone putty are countersunk into the disc spaces. An anterior cervical plate is then affixed to the spine to secure the fusion.